Today OnePlus announced the OnePlus 3T, a smartphone that succeeds the OnePlus 3 as the company's flagship smartphone. This move may be unexpected for some, given that the OnePlus 3 only launched back in June of this year, meaning that its time as OnePlus's flagship phone lasted only five months. However, as technology moves forward, it makes sense to update devices appropriately even if the changes do not align with the yearly cadence that we've come to expect for mobile devices. While the OnePlus 3T does succeed the OnePlus 3, owners of the OnePlus 3 do not need to fear that their device has been relegated to a position as a legacy device. As one might guess from its name, the OnePlus 3T is merely an iteration on the OnePlus 3 in order to take advantage of some technological improvements that have come along since the OnePlus 3's development cycle. Before going any further, I've made a chart comparing the OnePlus 3 and 3T so it's clear which aspects of the phone have changed. For the most part, the OnePlus 3T is essentially the same phone as the OnePlus 3. Both share the same ports, the same rear-facing camera, the same display, the same dimensions, and the same RAM configuration. What changes have been made are mostly improvements to internal components. Most notable is the move to Snapdragon 821, which helps keep OnePlus at the same level as the competition as far as processing power goes. OnePlus is using the standard MSM8996 Pro, which brings the peak CPU frequency to 2.35GHz and the peak GPU frequency to 653MHz, which will push performance slightly ahead of the OnePlus 3. Moving beyond the SoC, the battery is definitely the next area of interest. OnePlus has maintained the size and mass of the OnePlus 3, but the battery capacity has increased 13% from 3000 mAh to 3400 mAh. Without a teardown it's hard to say whether this is owed to improvements in battery density, or improvements to the phone's internal layout, but given that the total platform power of the phone shouldn't be changing it should bring a noticeable improvement in battery life. The last large change from the OnePlus 3 is the front-facing camera. The OnePlus 3 used Sony's IMX179, which is an 8MP sensor with 1.4 µm pixels paired with an f/2.0 lens. The OnePlus 3T bumps the resolution up to 16MP through the use of Samsung's S5K3P8 sensor with 1.0 µm pixels and the same aperture. In addition to the changes mentioned above, the OnePlus 3T comes in a different set of colors and storage configurations than the OnePlus 3. The OnePlus 3 came in a standard aluminum finish, and only had a 64GB model. 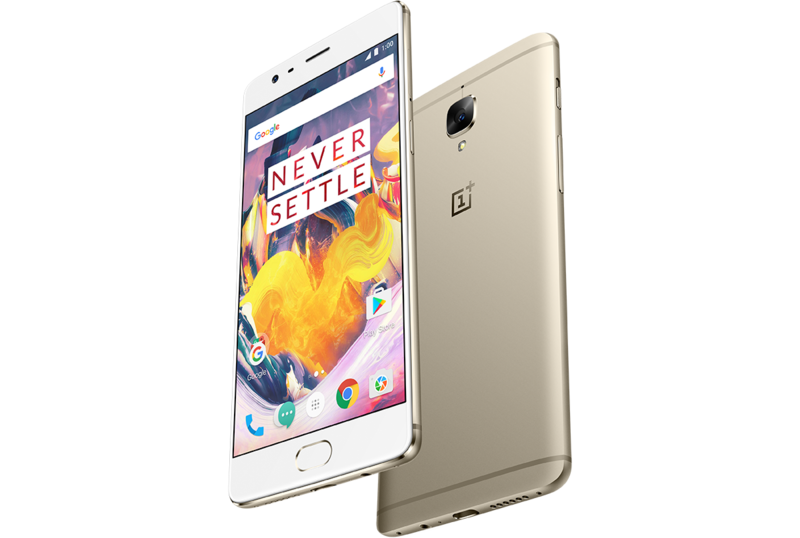 To differentiate it from its predecessor, the OnePlus 3T comes in a gunmetal grey finish and a gold finish, with the former shipping in 64GB and 128GB, and the latter only in 64GB. With all these changes also comes a roughly 10% increase in price, and it'll be interesting to see how the Android community feels about the balance of the price increase and the improved specifications. The OnePlus 3T will be available for sale in the United States on November 22, and in Europe on November 28. With its launch, the OnePlus 3 is being sent to end-of-life status from a manufacturing perspective. However, the OnePlus 3 and 3T are viewed as essentially the same device from a software perspective, meaning that while you will no longer be able to buy the OnePlus 3, OnePlus plans to bring software updates to both phones. When the OnePlus 3 receives a stable release of OxygenOS 3.5.1 both devices should be updated on the same schedule going forward, with an update to Android Nougat expected to ship before the year is over. I thought this would have been the case too but ive been quite surprised at how little difference i can notice between my Oneplus 3 and my Galaxy s7 Edge when it comes to resolution. It may have its benefits, but my biggest issue with it is that it's not truly 1920x1080, and thus shouldn't be allowed to advertise with those numbers. PenTile displays have been invading the advertising space of other displays that do truly achieve their resolutions for a long time now, and the fact that they're allowed to do so I think is why we haven't seen higher-resolution true-RGB AMOLED displays.